Go from the stall to out on the town with these fashionable boots! Justin's patented J-Flex Flexible Comfort System® offers the ultimate in comfort with a leather-covered cushion insole and triple density insole board with removable orthotic insole and black rubber outsole. 8-inch tall women's Justin Gypsy classic boot with a J29 toe and a unit heel with J-flex flexible comfort system insoles. They also have removable orthotic inserts. I love them, they are my first pair of boots and I could not have asked for a better pair! The price was amazing, and I keep getting compliments on them! Overall very satisfied with my purchase. After 8 years of lots of wear around the farm and while riding, I wore out my first pair! Just had to have another pair. I couldn't wear these boots, they run narrow even though I went up a size. However, they looked as good in person as in the picture and appeared to be well-made. Fit my wide foot comfortably, very nice boot. I have to wear wide boots due to several broken toes and foot bones that widened my foot through the years. This round toe boot fit like a wide width, very comfortable and hardly any break in time. I bought a similar pair at a Western shop and had to have toe streached before I could fit them comfortably. I'm unsure why these fit better (a wider fit) then previous pair from store.Happy with color, size, width and price.My first Justin Gypsy finally wore out after 3 years wearing them daily for horse mucking and yard work. I love my new boots, as always new boots take a minute to get use to, but they are great. I spent several days looking for the perfect boots when I was home visiting family in Texas. I found this style and fell in love, but none of the stores had my size. I was excited to finally find them online! I’ve worn them all day for several days now and I LOVE them! They are cute and comfortable! I love the roominess of the toe! Looked good in the ad and I was NOT disappointed when I got them! Looks and feels Great! I love Justin Ladies Gypsy Boots. Very comfortable and not tight around the legs. Wear them all the time for work. Have a dress pair I keep for special occasions too. Highly recommend for ladies that need a wider fit. Well I actually thought I was getting the black boots with teal tops. That’s what I wanted. I have a pair EXCATLY like these ones. That’s why I wanted the black and teal. So I was disappointed when I opened the box and it was the boots I already have. I don’t know what I did wrong but I didn’t get what I thought I had ordered. I know they are good boots just not what I wanted. Beautiful and great tread, look nice on. Only complaint is that they are tight across the top of the foot - stretching easily though! They fit perfectly.. Thank you.. True to fit. Wear them with everything!! Luv - Luv - Luv them!! Best boots I've ever owned!! I have worn these boots consistently for over five years! I have put many, many miles on them, as I volunteer at an equine-facilitated therapies program. I constantly get compliments on them (black with turquoise top) and I always say "they feel like slippers!" I would highly recommend!! Great boots second pair love Justin’s true to fit!!! I love my new Justin gypsy boots! I got such a great deal! Love ?? I would order a bit smaller than normal. I usually wear a 9 but my friend bought me a 8. I just bought my second pair. They lasted 2 1/2 years of heavy use. I LOVE these boots. They are so cute and also fit true to size and are comfortable. So happy I found them. Love, love, love these boots! If my husband would let me have more I would have a closet full of these. Undoubtedly the most comfortable boots I've ever owned. This was my first pair of Justin's but I can guarantee they will not be my last. I wear them almost everyday ( I have had them for a year now) and they still look new so they ware very well. I love the boots. Got the wrong color. Do not size down as it tells you to. I am 7.5 and ordered a 7.5 and it fits well. Most comfort shoes I own. Going on my 3rd pair. Love the way these boots look and fit. I would definetly recommend them to others. This makes my 5th pair of the gypsy Justin boots. They are the best wearing boots and my very first pair lasted 6 years before I completely wore the soles off. Highly recommend these. This boot you don't have to even break in, I put them on the first time and wore all day. I ordered a 10.5 but they feel like a 10 not sure if I will be able to wear them or not. The boots were exactly as described. They fit perfectly. Super great price. Quick shipping. I buy a pair of these almost every year, but my daughter's foot has changed and I am having a problem finding a 10C, any help where I can find these now? Unbelievably comfortable the moment that I put them on. The only break in for me was the tops where the pull on straps are at...they rubbed on my calves. Seriously, if you want comfortable wear all day long, you can't go wrong here. Justin rocks! I bought these boots as a work/riding boot. I like the rounded toe on these boots but my toes seem to push into the front. They are looser in the heel. I will probably just wear to ride not as an all day work boot. Best little slip on boot! I wanted these boots because they looked quick and easy to slip on an go! I was right! I am actually wearing them to work with my dress slacks and skirts! Very Cute! I'm a secretary in a school! I will need to buy another pair to wear to the barn and riding come spring! These boots were really nice, however, they were too small for my daughter. She does not live with me. I traveled 450 miles to see her to give her the boots. Luckily for us, there was a Boot Barn next door to where we met, and they happily let us exchange them for the right size. I have had an old pair of these boots for years. They really hold up to wear and perfect for riding and daily wear. I consider these boots my tennis shoe boots because they are so comfortable. These new boots live up to the Justin Gypsy standard. Sure you can buy more expensive boots, but these are the most comfortable you will ever wear! I have been wearing these kind of boots for years and they are so comfortable. There is no breaking in period and they wear for y ears.I love these boots and will continue to buy them. Fit great nice leather Justin is the only boots for me. This is my 3rd pair. Found the best price here. Comfortable and cute. Makes your foot look small.My last pair didn't last too long but spent most of the spring under water. They are not sold as water resistant and they are not.Nice pair of boots, good price, easy to find. I purchased these boots online and had them within a matter of days. They are my first pair of Justin... I wear a 9 in ladies size but ordered a 9.5 just to have a little more room if i wear a thicker sock. I could have just ordered the 9... But am satisfied with the comfort of the 9.5.... I will be purchasing another pair for my daughter... The color is so much richer in person. I love my new boots, thank you Stateline Tack! These boots are extremely comfortable. were delivered in excellent fashion and fast. Great fit, quality and price. Very happy with this purchase. I LOVE these boots! Justin boots are comfortable and hold up fairly well of daily use both in town and on the farm. I love this brand of boots. They fit great and last forever! Good quality product--- ordering Justin Boots again! The only boots I will wear! Comfortable and waterproof! Because I have 2 other Justin Ladies Gypsy boots and they fit like a glove...love em! I needed a bootie style boot for my now yearly trip to a ranch. These look comfortable and in my price range. Love the boots. No break in time. Hold up well. Most comfortable boots I have ever worn. Love them and the prices here are GREAT!!!!! Easy to put on, room for toes, durability and style. Love them - they are the best boots I have ever had! these are replacement boots for a pair we bought for our daughter 2 years ago. she has worn them out! looking forward to another great pair of boots. Price and quality!! Lowest price for these boots I could find. Needed new boots for my daughters horse judging activities. Hoping they will fit well and last a long time based on all the reviews I've read. My wife has owned a pair of these boots for years using them at the barn and they just finally wore out. I purchased two so my daughter had a pair as well. They are great quality boots that last forever! Plus, she says they are incredibly comfortable! The prices on State Line Tack are unbeatable for these boots! Justin Gypsy boots have been my favorite for years because they are very comfortable, are wide enough for my foot, durable, and water resistant. In the past, I have purchased them at local stores during Black Friday. This year however they were not on sale locally so I went online to look for sales. At State Line Tack, I got 3 pairs of boots for the price of 2 pairs. I definitely will be reordering these from them in the future if they continue to have such great sales. I've always wanted these boots. They are so cute and you can just slip them on and off. Comfort and style, great everyday wear. I need a good looking, inexpensive pair of casual boots to wear around in the cold weather. I LOVE the black/turquoise colors and I know a few girls that wear Justin boots & like them so I thought I'd give them a try. Had a pair for years.Great boot.Time for another pair. Have had one pair really like how they fit and how they hold up. I love them. Just got my first Justin Gypsy boots - they are so very comfortable. Love them. My daughter seen these and decided she wanted them for Christmas. I needed a new pair of barn boots. Are these the waterproof ones? BEST ANSWER: I do not wear these n deep water but have wore them n the rain and have not had wet feet. I also treated them with a leather waterproof spray when I got them. I love my boots! I wear them all the time. how can you know that the shoes will fit you if you don't try them on? BEST ANSWER: Ihi I am Lisa want I absolutely love these boots. They are very comfortable. I walk on concrete every day all for work and I can tell these are very comfortable and well made. As for the fit... No one pair of feet are the same each is different. I cannot tell you how a certain size will fit you but I can tell you they are true to size. I purchased my regular size and they are amazing. If you already wear boots the you know most are wider than a pump.. Lol. I do not have a flat or wide foot and there is pleany of room but not too much. They are just right. I hope this helps in your decision. Happy sho! They had a good sale on them, I couldn't resist! I don't normally buy shoes/boots on line for the same reason your are stating, but they had a good guide and, if needed, made returning them easy. The boots fitted perfectly and I still wear them at the ranch. Because I had some medical problems and/ or the weather, I have not used them for riding but am certainly hoping to in the next couple of weeks. So, if you're asking me, I would order boots on line. These boots run true to size. I have worn the justin gypsy round toe boot for over 10 years. I wear a size 6. Every once in a while a new pair may be slightly tighter but with a day or two of wear they fit perfect. State line tack has the best prices I have found but you could always try the boots on at one of the more expensive stores then order from state line tack. Hi my name is Lisa and I bought a pair of these boots. I absolutely love them. I walk on concrete all day everyday when I am at work and these are my favorite boots. I have found Justin Gypsy Boots true to size. I wear size 7 and that is same I order. There may be a store near you that sells these which you could confirm your size, then you should place your order as Stateline Tack prices and service are great! These specific boots are exactly the size they say. They break in within a week or two and then feel like slippers. I'm on my 11th pair. And, if they don't fit, you can easily exchange them. Stateline Tack is a great company to buy from! Well! If you've ever worn Western boots just order that size..
Get to know the brands and styles that usually fit you. For me, I know that pointy toe boots never work. You can always go into the store. It's a risk. This is the boot I wear and having been buying for years. I already had a pair of these boots that I bought from another store in town. I went to a local store and tried a pair on. Then I knew what size to order. BEST ANSWER: This item is available through us in the regular width at this time. How wide are these boots? BEST ANSWER: I found them to be pretty wide. I love them and they are some of the most comfortable boots, but unless I wear a thick sock, I've found they would slip off when I was riding to the point of almost falling off, hanging by a toe. I have a very average width foot and once they were broken in, this started happening. They're super comfy but I only wear them as barn boots to kick around in and don't ride in them any longer. Probably a medium width. They are wide enough for my feet to put a toe warmer in them in the winter. I have fairly narrow feet, but a very high arch. They are more narrow than other boots I have. Must use thin socks. Size is true size though. They were actually too wide for me. My feet swim in them. Hope that helps. Is the toe box roomy or tight? BEST ANSWER: I think it is just right. A little roomy, but not too much. When I teach riding lessons in the winter, I put a hand warmer packet inside each of my socks on top of my toes to keep my feet from getting cold. The toe box is roomy enough to allow for the warmer to fit without being uncomfortable. Very roomy! I have wide feet and can't wear any pointy cowboy boots. I have worn these for years and love them! That's all I ever wear to the barn and to work around the property. They do take a pretty good beating as far as wear and tear! It's actually pretty roomy! I waited an extremely long time for boots, and so glad I chose these ones! I find them just a bit tight. I do have wide feet though. BEST ANSWER: I bought these last fall and they are not steel toed. Very comfortable from day 1! No, these are not steel toes. Justin does make a Gypsy work boot with steel toes. They are not. This boot features the Fashion Round Toe. BEST ANSWER: They are not, they are leather. With that said, you can walk through wet grass and it takes a while for the boots to become saturated. I have another pair that I have worn in the store and rain and my feet have never gotten wet. Comfortable boots ... worth the money, well worth the money. Not waterproof... But very water resistant and mud proof. I have stepped in puddles and streams and my feet've stayed dry. Don't let them soak obviously. Yes. I haven't worn them in standing water but wear them when it rains and in snow. Love these boots!!! Not sure but we always just waterproof our boots when we buy them. No, water resistant. Decent boot for the money. Comfortable. 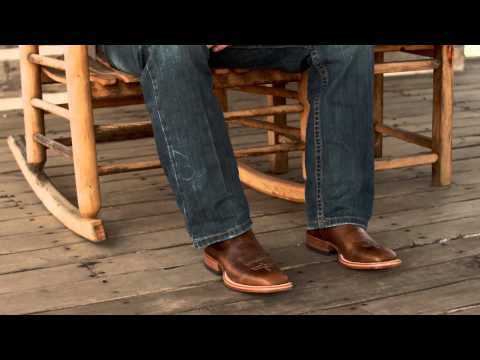 are these boots generally wider than Ariats? them on run outside and slip them off, they are the most comfortable boot I have ever had. I purchased an 11 and they are too big. They seem wide to me. I don't like Ariats and had one pair that I only wore a few times before I sold them. The square toe in these make them have a lot of space! Yes, they are wider than artiat .. plenty of toe room. BEST ANSWER: These are B width, after breaking them in they are good and comfortable A lot of toe room! Yes, they a B, or medium width. What color are the top of these boots? BEST ANSWER: These are great boots. The brown leather is different shades on different parts of the boot. On mine, the top is a deep chocolate brown. Toes are a lighters shade. The variation looks nice. Hi! They are a pink/purple color. BEST ANSWER: This particular boot doesn't have a steel toe! It's an amazing boot! Do justin make a boot with a slip resistant sole? BEST ANSWER: I have a pair of justin and they have a lot of grip on the bottom l. I have never had an issues slipping. Are all gypsy boots safety toe? BEST ANSWER: No mine are not and they are the most comfortable boots I've owned!! Love em'!! is this boots composite toe? BEST ANSWER: Is this boot a steel toe boots?